Take the opportunity to honor loved ones and/or celebrate by contributing to the Flower Guild for special occasions such as: birthdays, anniversaries, celebrations, in memory of or in honor of. Please fill out the form below and click submit. Then mail a check to St. Alban's or place one in the offering plate with "Flower Guild" in the memo line. Suggested $50 minimum donation. Thank you for your commemoration flower request. You will receive a confirmation from Jessica Ewell about your request. 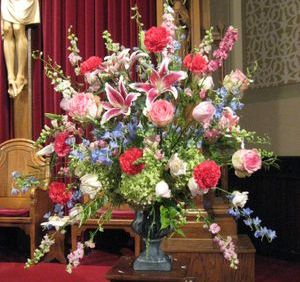 All checks are to be made payable to St. Alban's with Flower Guild on the memo line.